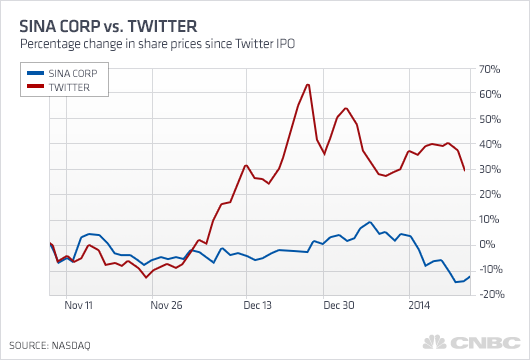 Investors who forgot to sign up for Twitter may have a second chance: In China. Shares of the U.S.-based microblogging site have risen 33 percent since their November initial public offering on hopes that the industry's dominant player will continue to attract advertising dollars. By now, many investors probably feel late to the game, given that the profit-less company has a market capitalization of $44 billion, or a heady 39 times consensus earnings. With all the buzz around Twitter, it has been easy to forget about its Chinese counterpart Weibo, which is 71-percent owned by Sina Corp. Shares of Sina, which trade in New York, have fallen 7 percent since Twitter's IPO, partly due to a general selloff in Asian markets in the last few weeks. In turn, the market-implied valuation of Weibo has become seriously squeezed. BNP Paribas estimates Sina's other assets, including a portal business, equity stakes in companies including e-commerce giant Alibaba, plus some cash, are worth about $3 billion. That indicates Weibo is worth only $2.5 billion, or roughly 7 times BNP's estimated revenue for the microblogging site in 2014. Employees work at Sina Corp.'s headquarters in Beijing, China. The valuation gap between Twitter and Weibo should soon narrow as their similarities become clearer. Both companies are widely considered the leading microblogging sites in their respective languages, with Twitter commanding about 100 million daily active users and Weibo more than 60 million. And there's reason to believe Weibo's users will stick around. Just as everyone from investor Carl Icahn to Wal-Mart speak to the public through Twitter, major Chinese companies have embraced the platform as a news outlet. Even China's central bank has recently made announcements over Weibo. Both companies have reached a stage where they can post advertisements without a major risk of alienating users. Sina reported that Weibo's revenues rose 124 percent in the third quarter of 2013, faster than the 105 percent growth in Twitter's revenue over the same period. And investors have extra assurance that Weibo's advertising revenue will roll in for some time. Last year, Alibaba agreed to purchase $380 million in advertisements over the next few years. That amount is roughly twice the amount of revenue analysts estimate Weibo generated in 2013. The committed money from Alibaba should merely be considered a starting point. Echo He, an analyst at Maxim Group, said retailers who use Alibaba may prefer to advertise with Weibo because it's very expensive to post ads within Alibaba's Taobao, a site similar to eBay. Beyond Alibaba, Weibo may get another boost if expands its range of advertisers, perhaps through a high-speed advertising platform that lets marketers bid for ad space based on information about users. Such platforms are in a very early stage of development in China but already account for more than 20 percent of U.S. display ads in the U.S., according to eMarketer. Sina hasn't used one with Weibo yet, according to Xuehua Shen, co-founder of iPinyou, a Chinese firm that specializes in real-time bidding. One concern is that the popularity of other social networks in China could threaten Weibo. Sina rival Tencent has a friend-to-friend network called WeChat that effectively allows users who know one another to share messages and content. Its user base has exploded recently and analysts say it has more daily active users than Sina's Weibo. But that shouldn't be cause for alarm. Unlike WeChat, Weibo can serve as a means to distribute news from a broad range of sources, rather than simply between people who have elected to connect. Advertisers will probably remain interested in the members of Weibo's audience who are relatively more educated and keep up with a general news flow. Indeed, other services more similar to Sina's Weibo appear to be slipping behind. Maxim Group's He said her channel checks indicate that rival such as TenCent's version of Weibo have lost users recently. TenCent doesn't disclose such figures and the declined to comment to CNBC. Of course, it's reasonable for Sina to trade at some discount to Twitter, given the volatility of Chinese markets. But Sina's connection with Alibaba, which bought an 18 percent stake in the company last year at a roughly 30 percent premium to current trading levels, should provide reassurance. Investors should consider Sina shares before they really become something to tweet about.